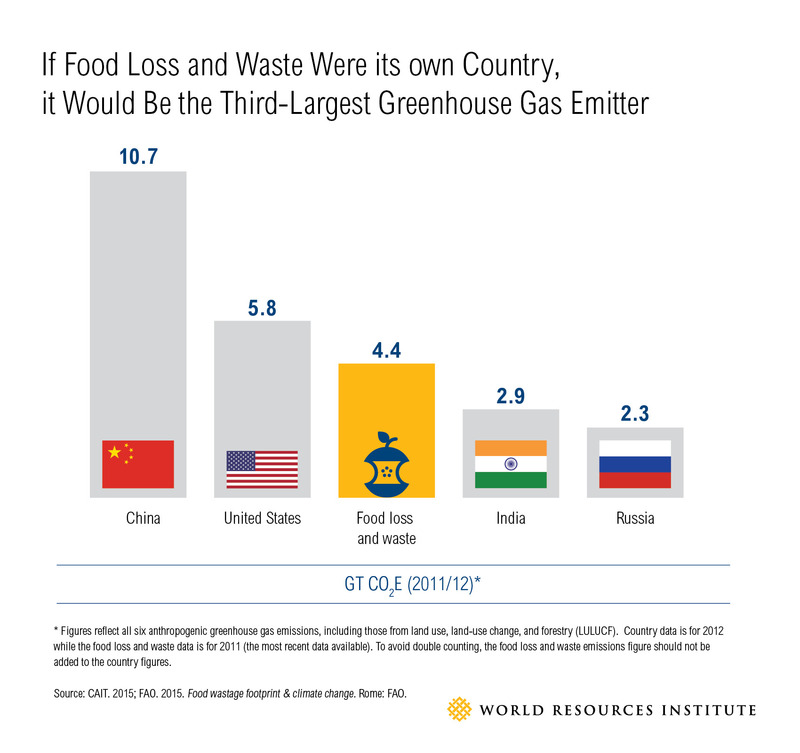 Home > Blog > What’s Food Loss and Waste Got to Do with Climate Change? A Lot, Actually. World leaders have been meeting in Paris to agree on a global agenda for tackling climate change. Issues addressed include energy generation, transportation fuels, forest conservation and food production, among others. But one area needing more attention after Paris is reducing food loss and waste. Yes, the food lost near the farm or wasted near the fork has a lot to do with climate change. Consider for a moment that, by weight, around a third of all food produced for human consumption is lost or wasted. According to figures recently released by the Food and Agriculture Organization of the United Nations (FAO), food loss and waste accounts for about 4.4 gigatonnes of greenhouse gas emissions (4.4 Gt CO2e) per year. To put this in perspective, if food loss and waste were its own country, it would be the world’s third-largest emitter—surpassed only by China and the United States. 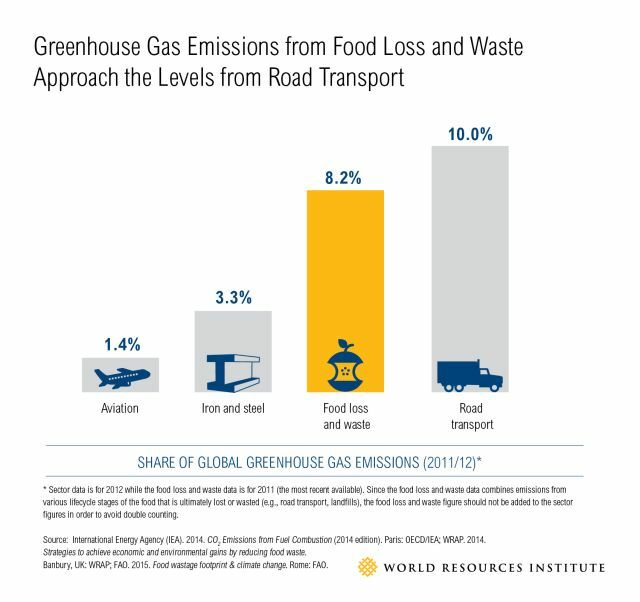 In fact, food loss and waste generates more than four times as much annual greenhouse gas emissions as aviation, and is comparable to emissions from road transport. In short, it’s a big deal. Where Do Food Loss and Waste Emissions Come From? The emissions from land use change and deforestation associated with producing food that is ultimately lost or wasted. Food loss and waste impacts not only climate, but also personal and national economics. Food waste in households and restaurants costs an average of $1,600 per year for a family of four in the United States, and £700 (about $1,060) per year for the average household with children in the United Kingdom. Annually, about $32 billion worth of food is thrown away in China. In sub-Saharan Africa, where many farmers earn less than $2 a day, post-harvest losses have a value of up to $4 billion per year. Globally, the FAO estimates that food worth about $940 billion is lost or wasted each year throughout the entire food supply chain. Reducing food loss and waste could help avoid these economic losses and reduce financial burdens, particularly on the world’s most vulnerable people. In sub-Saharan Africa, one of the world’s poorest and most food-insecure regions, the World Bank estimates that just a 1 percent reduction in post-harvest losses could lead to economic gains of $40 million each year. And out of that $40 million, most of the benefits would go directly to the smallholder farmers growing the food. Reducing food loss and waste is thus an example of what’s good for climate being good for the economy. It’s one of those “win-win” strategies everyone has been looking for in Paris. So governments should not overlook this as an effective strategy to reduce emissions. Plus, pursuing food loss and waste reduction will help countries meet Target 12.3 of the Sustainable Development Goals – the one calling for halving food waste by 2030 – that were adopted this September at the United Nations. Just this week, the French National Assembly passed a law that makes it illegal for supermarkets to destroy edible food and requires them to establish processes for food recovery with food banks. The legislation will also introduce food waste prevention as a topic in schools. And this fall, the U.S. Department of Agriculture and U.S. Environmental Protection Agency set the nation’s first-ever food waste goal, a 50 percent reduction by 2030. The private sector has a role, too. Companies should follow the lead of the Consumer Goods Forum, which earlier this year resolved to reduce food waste from member operations by 50 percent by 2025. Now that’s ambitious leadership. And let’s not forget households. We all can play a part, starting with reducing the amount of food that ends up in our rubbish bins. Much like solving climate change, there’s something for everyone to do when it comes to reducing food loss and waste.